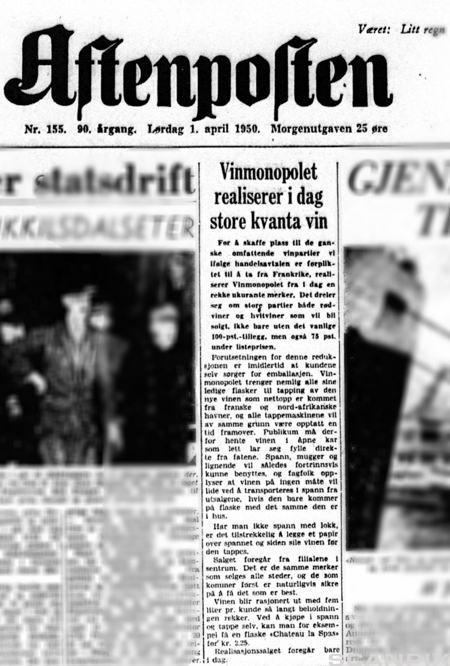 Aftenposten, Norway's largest newspaper, announced on its front page that the government-owned Wine Monopoly (the Vinmonopolet, which were the only stores allowed to sell alcohol) had received a large shipment of wine in barrels from France, but it had run out of bottles. So to get rid of all the extra wine, they were running a one-day sale, selling the wine at 75% off and tax-free. The catch was that buyers had to bring their own containers to put the wine in. "Buckets, pitchers, and the like" were recommended. When the Vinmonopolets opened at 10 a.m., long queues formed outside. Many people who read about the sale on their way to work went to hardware stores, bought buckets, and lined up. According to legend, numerous empty buckets could later be found lying in the streets, left there by people who had realized, while standing in line, that the sale was a hoax. A story was told of one man who, after being taken in, poured some wine into a bucket, returned to work, and told his colleagues about the incredible sale. All his colleagues promptly rushed off to the store. One of the reasons the story was credible was because bottles really were in short demand during the post-war years. 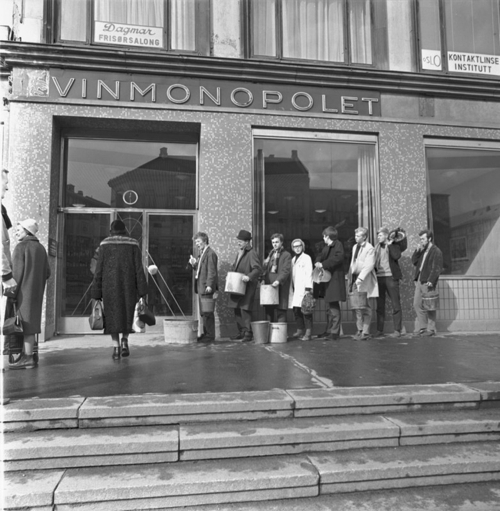 People lining up outside a Vinmonopolet with buckets. The picture was taken in 1969 and appears to have been a recreation of the 1950 hoax.